When you have a chance to watch a real Hall of Famer play golf, you should. That may be why I was joined by dozens of golf fans as we followed Laura Davies around Lancaster CC for the second round of the 2015 U.S. Women’s Open. Davies won the 1987 U.S. Women’s Open, three other majors, and many other tournaments in a long and popular career. She was inducted into the World Golf Hall of Fame the day after Lancaster, in a ceremony at St. Andrews. In this year’s Women’s Open she posted an even-par 70 in the first round, finishing just before a thunderstorm tore through the course Thursday evening. Friday starting times were pushed back a half-hour, in her case to 7:48 a.m. The storm added to the second round challenges. After cleanup, there was only enough time to cut the greens, the fairways, the surrounds, and the first cut of rough. The main rough had another day to grow higher, along with a torrential downpour to absorb, and thus became even thicker and juicier. Second round scores reflected the conditions. Davies was among those who paid for that fact. As she admitted during a post-round interview, she didn’t drive as well on Friday as she had the day before. The rough and some untimely three-putts led to more bogeys than birdies. The 51-year-old still doesn’t giving it a go, however. On the 15th hole, her sixth of the day, Davies faded a drive right of a fairway bunker, into the rough. At 130 yards out, she faced a very tall tree in her direct path, only 40 yards away from her. After a long discussion with her caddie, Davies said, “Looks like a good lie,” and whacked an iron, pulling it just slightly left of the blocking tree. The ball landed left of the green side left bunker, perhaps staying on the steep slope only because of the storm. Her shot from there landed 3 feet above the hole, and she made par. On the next hole, Davies wasn’t so lucky, and her temper made a brief appearance. The sixteenth hole is a short, down-then-up dogleg left par 4. Davies hit iron off the tee, presumably to be safe from the heavy bunkering inside the dogleg. Her ball went wide right and short, hit into trees, and dropped into heavy rough. A USGA volunteer put a little flag near the spot, but Davies still struggled to see the ball in the high turf. Davies hit down with a hard wedge, popping the ball out to the fairway only a bit farther than Song’s drive. From there Davies made a bogey. 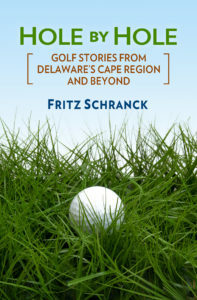 She had already bogeyed the twelfth, a downhill par 3, when her tee shot landed on the false front edge of the green and rolled back into the adjacent stream. Davies made a great chip from her drop, and a one-putt for the 4. She also three-putted the par-4 fifth hole, leading to a short angry whack at a shoe with her putter. On the other hand, her birdies were a huge lift, for her and the many fans watching Davies. She hit an approach from 160 yards to four feet on the first hole, her tenth, and converted it for the birdie. Her approach from 112 yards on the par-4 third hole finished twelve feet away, and she calmly rolled in her first putt. She finished 2-over for the day and for the first two rounds, making the cut in her 27th Women’s Open. The crowd at the ninth hole gave Davies a nice round of applause. Davies played the third round in even par, her final round in 5-over, and finished the tournament tied for 47th. Unfortunately, travel delays at Philadelphia International Airport kept Davies from reaching her Hall of Fame ceremony in Scotland, until sometime during the post-induction reception. Whoever was responsible for her scheduling apparently had a touchingly innocent and completely misguided faith in on-time flights out of Philadelphia during the summer. This is the third in a series of columns about the 2015 U.S. Women’s Open. Mason Jones, a high-ranking 2015 graduate of Cape Henlopen High School and a multi-year Viking golf team leader, won a $10,000 college scholarship from the Stephen R. Lett Scholarship Fund. He will attend Cal Poly San Luis Obispo this fall. The announcement of the Lewes resident’s award came during the July 24 award ceremony at this year’s Lett’s Play Golf Tournament, the main fund-raising vehicle for the Fund, and the seventh such event at Kings Creek Country Club. Scholarship winners demonstrate qualities of leadership, academic discipline, and community awareness. The Fund awards $2,500 per year, and uses an independent panel to make the award selections. The tournament format uses one best score of each foursome at the par 4s and 5s, and the two best scores of the foursomes for the par 3s. Head Golf Professional Kevin Wiest said, “A great turnout, perfect weather, and a terrific cause all made for another successful Lett Scholarship Fund outing.” Vinnie Nardo, John Purple, Jr., Mark Agnew, and Kevin Jones teamed up for the winning gross score of 76, against 102 competitors. First place net went to the foursome of Walt Jones, Hayden Evans, Bill Manning, and Bernie Genevish. For more information about the Fund, go to www.lettscholarshipfund.com. The Kings Creek Country Club Ladies Golf League played a Shamble format tournament July 23. Tricia Ritthaler, Barbara Hines, Yona Zucker, and Margaret Moore won the event, followed by the team of Anita Pettitt, Dorrie Spilman, Leslie Ledogar, and Mardee Corbett. Nadine Carrick, Jennifer Falcone, and Pattie Magee came in third, while Carolyn Ortwein won the closest to the pin contest. On July 28 the Sussex Pines Ladies 18 Hole golfers played a Best Select Tee Shot format, with two-person teams. Linda Townsend and Jenifer Hagy won first place, with Hagy also winning the closest to the pin contest. Darlene Selwich and Sandy Harrison came in second and Susan Brady and Carol Love took third.